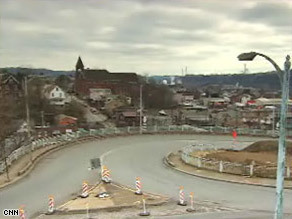 BRADDOCK, Pennsylvania (CNN) -- What happens when business and government turn their collective back on a town and just walk away? Braddock, Pennsylvania, is what happens. Braddock, Pennsylvania, has suffered since the steel mills went out of business in the 1970s and 1980s. When steel was king, the population of Braddock surged to more than 20,000 people. With its proximity to Pittsburgh and its location on the Monongahela River, it was an ideal location for a steel town. When steel mills began closing in the 1970s and 1980s, Braddock was not immune. In 1982, Braddock's main mill, the Carrie Furnace, closed its doors, putting thousands of people out of work. Throughout the 1980s and 1990s, residents left the town seeking work in other parts of Pennsylvania. The 2000 census put the population of Braddock at 2,900, but it has dropped further, according to residents. Home prices have plummeted and real estate is as inexpensive as $6,000 for a single-family house. Historic pictures show a polished downtown and a bustling community. Now, most businesses have closed their doors, leaving only a handful to serve the community. A drive down Braddock Avenue, the main street, indicates the town has seen the bottom. The avenue is lined with crumbling offices and stores, boarded windows and empty lots where buildings once stood. But there is hope in the town. In 2005, Braddock elected John Fetterman by one vote as its mayor. He is originally from York, Pennsylvania, and has lived in the area of Braddock for eight years. He has an MBA from Harvard and started a program that helped dislocated youth from the area receive their high school equivalency degrees. At 6 feet 8 inches and 325 pounds, he is an imposing figure. He chooses to dress in Dr Martens boots, baggy jeans and Dickies short-sleeved shirts because he feels he is able to connect with the people better dressed that way. He shaves his head and has a goatee. When asked if he thinks the town is at rock bottom, Fetterman replies, "I don't believe that it's the bottom in the sense that this is a bad place. This is what can happen when you turn your back on a community." Since he was elected, Fetterman has made it his mission to give Braddock a prosperous future. He has given incentives to businesses to relocate to his town. The main incentive is large manufacturing space at a fraction of the cost in a normal market. A company that converts diesel engines into vegetable-oil burning engines, Fossil Free Fuel, relocated to Braddock from Allen, Pennsylvania. "The initial building was about 14,000 square feet and supposedly the asking price was $25,000. And we were like how do you get so much space for so little money?" said David Rosenstraus, one of the owners of Fossil Free Fuel. "I think for a very small business like us, not having very much capital to work with building a shop, and investments going into tools and things inside the shop, [we] would be spread thin if we had to pay a lot for the actual building." On the site where the Carrie Furnace steel mill building still stands, the county plans to convert the contaminated land into commercial and residential space. Allegheny County executive Dan Onorato is driving this plan, "We don't look at this like a liability. We see some potential here. We can take back 147 acres, take back the riverfront and make this a viable spot again. But you have to invest public money into the infrastructure to make that happen. It won't happen on its own. For example, this place closed 25 years ago, it's still here. The public sector has to come in and invest." Braddock still has many obstacles to overcome, but Fetterman believes that it's possible to grow, "I'd like to see Braddock move towards -- continue to move towards -- a safer place that is moving towards better outcomes for everybody."